By Aiza Coronado on 04/05/17 • Leave a comment! You’d probably think that you don’t need a smart luggage in your life, but if you’re air traveling for even at least once or twice a year, you’d wish you should have bought one earlier. See, smart luggage isn’t just for the tech-savvy traveler. They were made to solve actual travel problems, especially for people with travel anxieties. Here’s a rundown of the practical uses of a smart luggage. Smart luggage are loyal to their owners. Some suitcases like the Planet Traveler Tech Case sports biometric locks that can only be opened with your fingerprint. They’re also traceable, equipped with GPS trackers so you can check the location of your luggage via your smartphone. If you’re traveling for long hours, chances are, your electronics devices will be drained. Smart luggage packs you an extra charge so you can conveniently recharge your gadgets anytime, anywhere. Aside from the external USB port that you can easily access on the go, the Bluesmart Luggage have dedicated compartments for your laptops and tablets. You’d be surprised how some of the smart luggages can follow you around so you don’t even have to pull them around. The Travelmate Robot case is equipped with sensors so it can follow you around and avoid obstacles along the way. This is handy, especially if you travel with kids and need to work with all the hands that you have. These are just the top perks of having a smart luggage. Currently, there are lots of smart luggage with their own unique features that might help you overcome your own travel problem. By David Ponce on 11/17/16 • Leave a comment! Unless you’re getting yourself into Edward Snowden territory, we can’t quite figure out when you would need something like the Spy Coins. Still, it’s cool to know they exist and if you want to add some imaginary pizzazz to your life, we suppose there’s not harm in using them. 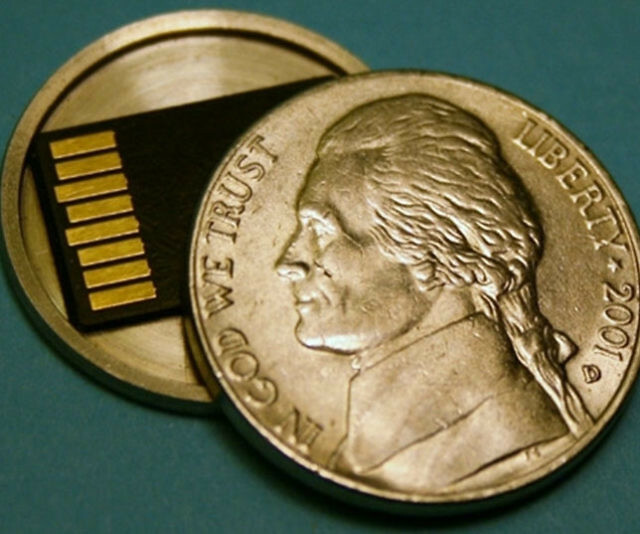 What they do is pretty obvious: there’s a hollowed-out center in which you can easily stuff a MicroSD card. You can also easily lose a MicroSD card by accidentally using one of these to pay instead of a regular coin, so be careful. They’re about $30 each. There’s Catnip Wine So You Don’t Have To Drink Alone! You fancy a little nightcap before hitting the sack? Or maybe you don’t want to think of it like that, maybe you’re more upfront: you like getting smashed by yourself? Look, we don’t judge, but if you’ve grown tired of doing that alone, but still can’t stand the company of humans, you might want to consider enrolling your cat into your solo drinking activities. Yes, your cat. 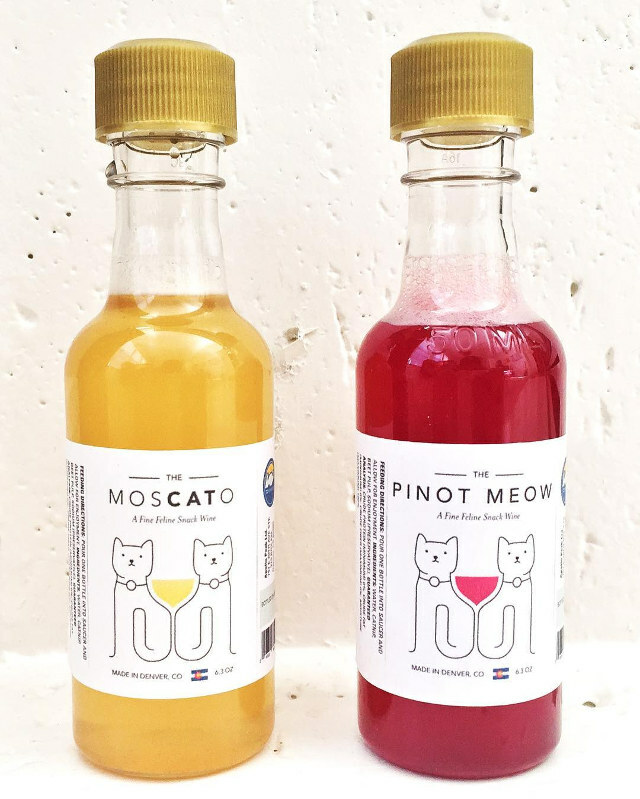 Pictured above is The MosCATo, and the Pinot Meow, two catnip-based non-alcoholic drinks for your feline friend to enjoy. They’re made from a proprietary blend of catnip, fresh beets, and natural preservatives. And what do they do to your cat? Well, depending on how much they drink – the effects will vary. When cats smell catnip, they tend to get funny, move around and play a lot. The exact opposite occurs when they ingest catnip. They normally will become more “mellowed” out when they drink the wine so it might actually help for those restless nights. Mellowed out kitty? Yeah, they already spend 3/4 of their life asleep, so we’re not sure where the fun is in this drink. But we imagine it does’t matter anyway, you’ll be too smashed to care. It’s $12 for an 8 Mewounce (get it?) bottle. By David Ponce on 05/25/16 • Leave a comment! 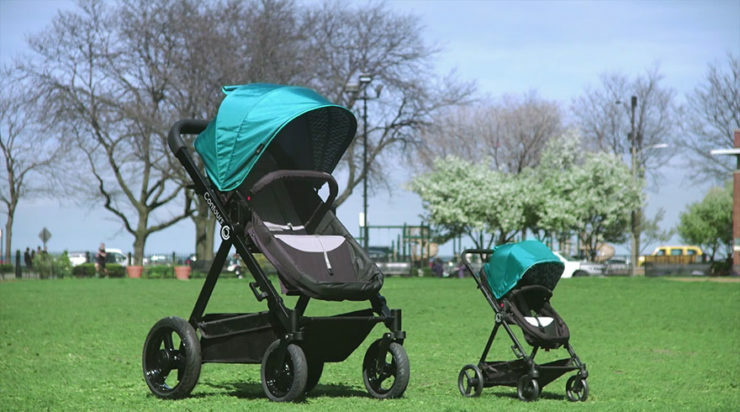 Because you can never be too sure that your baby is comfortable enough, the US baby products company Kolocraft has created an adult-sized version of their Contours Bliss stroller for you to try out. That’s right, it’s an exact replica of the baby stroller, only it’ll fit a fully grown adult and give him or her the riding experience of a lifetime. You can find out what it feels like to be pushed around by someone, and get a sense of just how comfy your little one is in the company’s stroller. 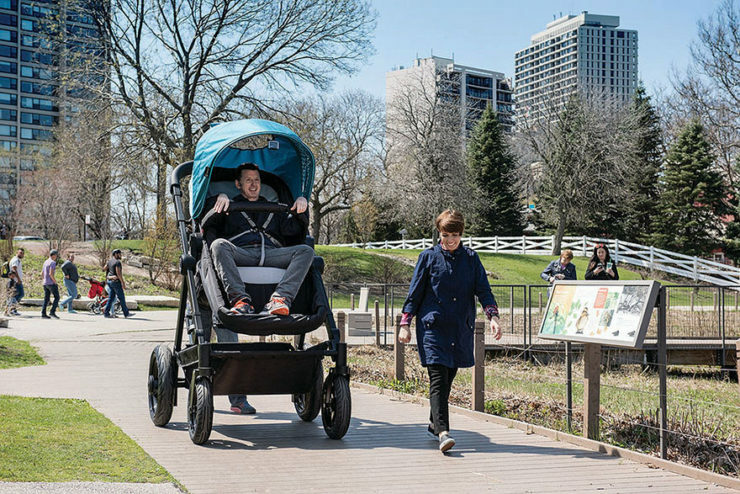 It’s not for sale, obviously, but you can book a ride when the company has their next test-drive at Chicago’s Mary Bartelme Park, on June 7th. Sure, there might be a lineup for your turn, but you’re all adults and no one is going to throw a tantrum, right? Cats are great. Even their little raspy tongues licking you is kind of fun. But haven’t you ever wished you could be the one liking them, rather than the other way around? No? Well… neither have we. But the folks behind Licki Brush seem to think there’s a market for this. Either that, or we’re looking at a very late April’s Fool. 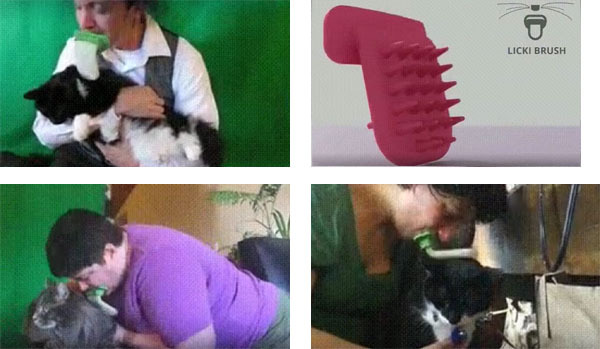 The Licki Brush is meant to be inserted in your mouth, and used to brush/lick your cat without getting his fur in your mouth. There’s a website, and they mention an upcoming Kickstarter, though that’s all the info we have. How much? Is it real? Is anyone going to buy this? It’s all up in the air now, but we thought it cute nevertheless. By David Ponce on 05/02/16 • Leave a comment! You guys remember the Baby Mop? It was a onesie lined with microfibre finger pads that cleaned the floor as your toddler crawled around. That was an awesome product! Well now you can have the same sort of “innovation” for the rest of the family. 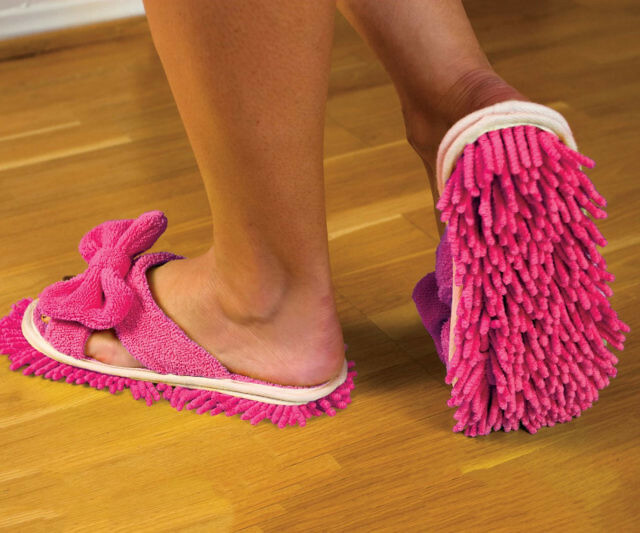 The Floor Cleaning Slippers’ soles are lined with microfibre finger pads as well, which pick up dust and small debris as you walk around. 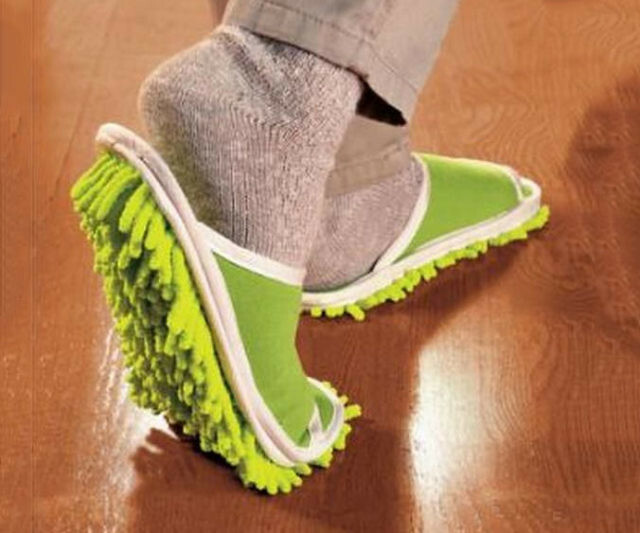 Sure, it’s only going to clean the most walked-around areas in your home, leaving corners to collect all the dust bunnies you didn’t pick up. But we suppose it’s better than nothing. The soles do detach easily for cleaning. And at $5 for a pair, who not get one? Oh… ‘sexism alert’: they only come in ladies sizes 6 to 9. By David Ponce on 03/24/16 • Leave a comment! So, are you one of those people that goes to clubs, gets table service, and then proceeds to shower everyone in your vicinity with obscene amounts of Champagne? Probably not, I mean, why would you be reading this website if you’ve got so much money burning a hole in your pocket. 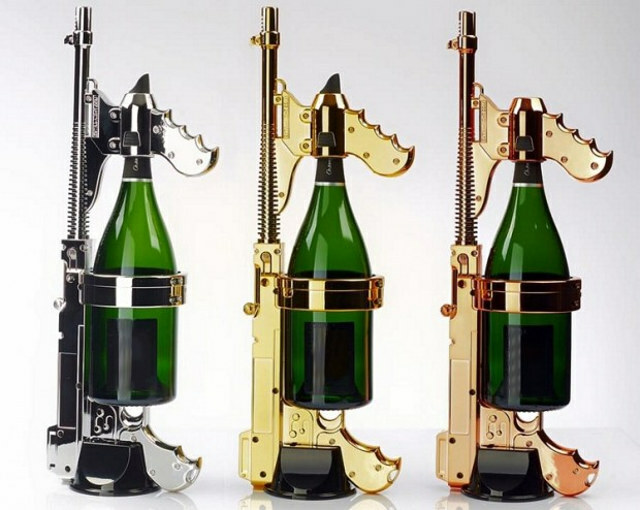 In the off chance you wandered here by accident though, can we interest you in this Champagne Machine Gun? 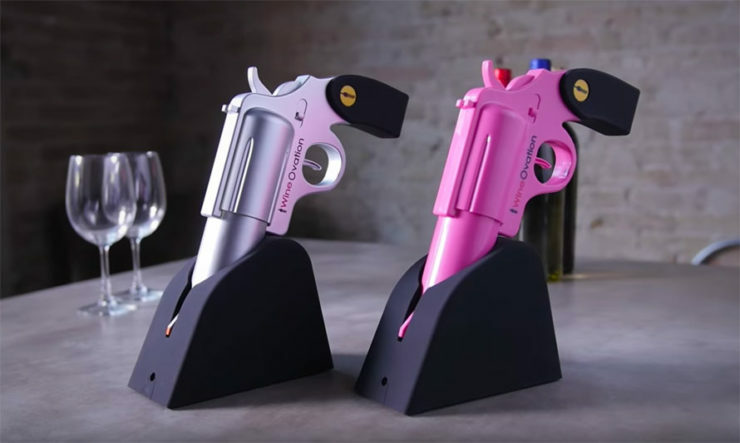 It just holds your bottle so you can look like you’re shooting people as you spray them with your overpriced bubbly. 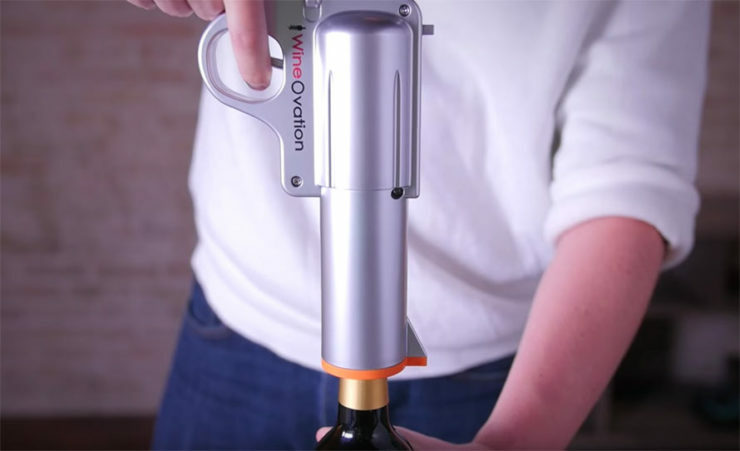 There’s no real mechanism there; you still have to open your bottle manually, and shake it up, and even put your finger over the opening to get any kind of real pressure. Well, we’re not sure about the finger part, since it does come with a “diffuser” spout so we think maybe that does the job. Oh, and it’s $459. It comes in Gold, Chrome, and Rose Gold colors, and considering the price and ostentatiousness, we think there’s a decent chance there’s a market for this. We just don’t think they read this site. Spending too much on craft beers might not be enough to make you feel like these beers are really special. 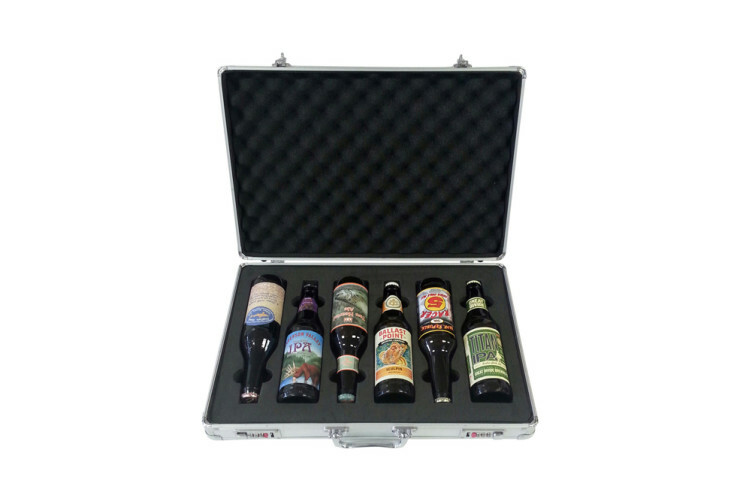 What you need is to wrap them up in a special briefcase with a beer-shaped foam placeholder, so that way you can look like a true fancy pants beer connoisseur when you get to the party. 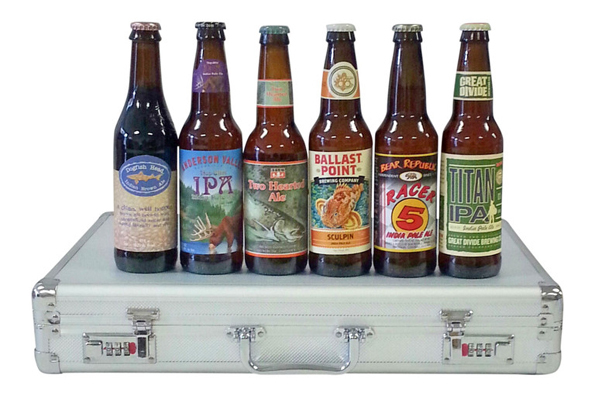 The Beer Briefcase does just that, and it comes with 6 fancy pants craft beers already: Titan IPA by Great Divide, Two Hearted Ale by Bell’s, Hop Ottin’ by Anderson Valley, Sculpin IPA by Ballast Point, Racer 5 by Bear Republic, Indian Brown Ale by Dogfish Head. We don’t know the first thing about fancy craft beer, so we’re hoping they, and the briefcase, justify the $75 asking price.